The US world of baseball has seen one of its most famous records broken as Giants' slugger Barry Bonds hit his 756th home run on Tuesday. In his 22-year career, Barry Bonds, has now hit the baseball over the fence more than any other player, overtaking Hank Aaron and, last year, Babe Ruth. But it is not just Mr Bonds who will go into the record books. 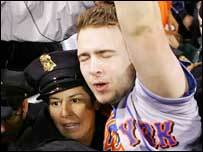 The fan who caught the ball, 22-year old Mets fan Matt Murphy, may make up to $1m (£500,000) by selling it. Mr Murphy, from Queens, New York, was visiting San Francisco on a one-day stop-over on his way to Australia, and decided to buy tickets to attend the baseball game at the last minute. He emerged from a scrum - his face bloodied and his clothes torn - holding the ball high in his hands. He was quickly escorted to a secure area by a team of San Francisco police officers - still wearing the jersey of the rival team, the New York Mets, which he supports. 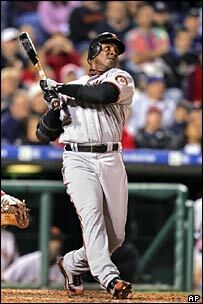 The slugger who hit the home run - Barry Bonds - said he had no interest in keeping the ball for himself. 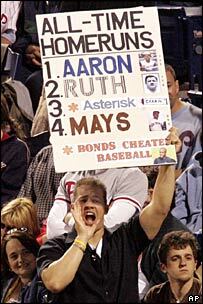 "I've never believed a home run ball belonged to the player," Mr Bonds told reporters after the game. "If he caught it, it's his. I just hope he didn't get hurt." Instead, Mr Bonds focused on his historic record, which means that he has hit more home runs than any other player in the history of major league baseball, exceeding the total of 755 set by Hank Aaron of the Atlanta Braves in the 1970s. 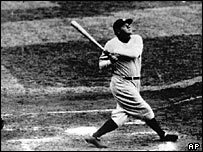 Only one other player in the history of baseball, the legendary Babe Ruth, the Yankee slugger of the 1920s, has ever hit more than 700. Mr Bonds paid tribute to his late father, also a baseball player, who first encouraged him in his career, as a video tributes to the slugger was played from Mr Aaron. And he received a congratulatory phone call from the Commissioner of Baseball, Bud Selig, who had not been in attendance - unlike the 450 sports journalist who had flocked to the Giants' AT&T stadium. If Mr Murphy sells his ball, experts at sports auction houses say it could fetch at least $500,000, and perhaps up to $1m, if sold at auction soon after the event. "There's no way of really telling what it's worth," said Mike Heffner of Leland's auction house. But they warn that the value could go down as Mr Bonds continues to break records. "The main thing I would say is sell it quick because in today's memorabilia world, proximity to the event is important," said Doug Allen, president of Mastro Auctions. The ball hit by Mark McGwire, who broke the single-season home run record with 70 in 1998, was auctioned for $3m, but may now be worth less. When Barry Bonds exceeded this total with 73 home runs in 2001, that ball fetched only $450,000. The man who bought both of these balls, Spawn comic book creator Todd McFarlane, says he wouldn't over-pay for this one. "I don't think it's the ball," he said. "The ball is the one where he says, I quit, and the last homer he hit is the ball. I'll go all-in on that one." And in the longer run, there is also the threat that younger players - notably the Yankees' Alex Rodriguez, who has just hit his 500th home run - could eventually overtake Bonds' record. The value of the ball could go up if there is a bidding war between auction houses. However, if Mr Murphy sells at auction, he will not get the full value, as the auction house will take a percentage of the sale. Another option for him would be to sell the ball directly to a sports memorabilia company who might then sell it through a lottery. Brandon Steiner, the owner of Brandon Sports Memorabilia, says he would pay between $350,000 and $500,000 for the ball, and then sell 2000 lottery tickets at $500 each, with the losers gaining a consolation prize of an autographed baseball. However, one reason why the Barry Bonds home run ball may be less valuable is the cloud over the slugger's record. He has been accused of using banned drugs - steroids - to boost his home run total. Although he has denied the accusations and he has not been convicted, the claims have cast a shadow over his achievements. Doug Allen of Mastro Auctions said that in recent auctions the value of items related to Mr Aaron attracted higher bids than those connected with Mr Bonds. "I don't think it will necessarily rebound in the next couple of weeks," he said. "With the cloud of steroid concerns, until that goes away I don't think it's ever going to stabilise." Bonds' tainted image has affected more than just the value of his historic home run ball. An estimate in Sports Illustrated magazine suggested that, if there were no suspicions about the sluggers' record, he could earn more than $30m in endorsements of products such as athletic shoes, sports drinks, and snacks - compared to the $2m he currently receives.